Living Area 9,564 Sq. ft. Situated on over 11 acres in the private community, Jericho Mountain Estates, this 5 BR, 6 full & 2 half BA, estate home was hand crafted by DJS Custom Builders just 5 years ago w/beautiful custom amenities both inside & out! 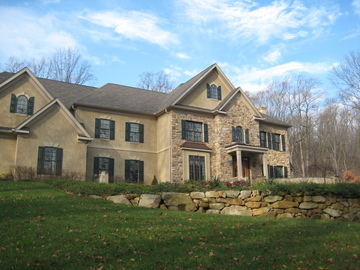 As you enter up a long country drive, this magnificent, stone & stucco home sits majestically atop a wooded landscape w/ a backdrop of Jericho Mountain. Enter into a dramatic 2 sty foyer w/curved staircase & intricate millwork. 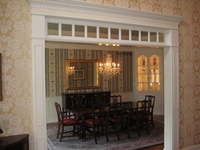 To the left & right are FDR & FLR w/Atlanta trim & transoms at the entry ways. 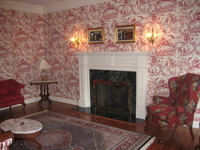 The 1st flr features 10' ceilings in all rooms except the 2 sty family room w/stone FPL which has grander clgs. Gourmet kit. 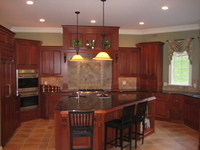 w/Wolf range & ovens, ctr island w/vegetable sink & steamer, granite CT's, Wood Mode cabinetry & sun drenched brkfst rm. Library w/cust cherry built-ins, computer rm, mud rm, guest BR w/full BA, 2 PR's & 4 car side entry garage. Above, 4 BR's & 4 full BA's. Below a finished bsmt w/billiard rm, exercise rm, den w/FPL, wet bar, rec area, sit rm, full bath & porch.